View and correct OCR results. Nuance Communications yesterday released a new version 6 of its PDF Converter for Mac, software for Apple users to view, convert, edit, combine and sign industry-standard PDF files. Among other things, the software enables users to assemble PDF documents from various sources, convert PDFs into editable formats, create searchable files from scanned documents, and create and fill out PDF forms. I have previously favorably reviewed Nuance’s Power PDF software for Windows computers, both on this blog and in Law Practice magazine, calling it “a full-featured professional PDF program with all the capabilities lawyers would need.” I have not used PDF Converter for Mac. 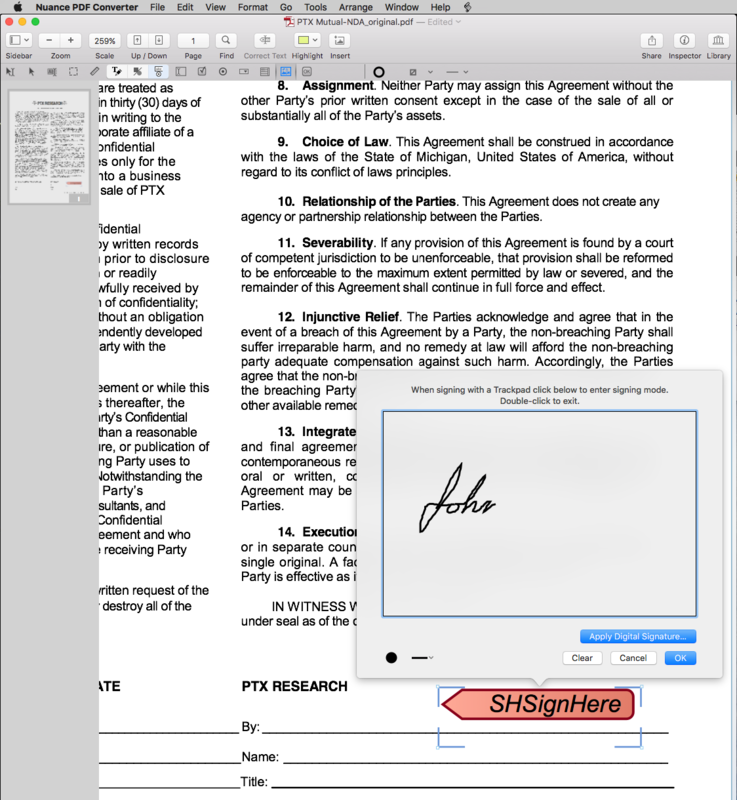 Sign documents using a mouse or Trackpad. View and correct OCR results. Users can now can view and proofread the recognized text of a scanned or image-based PDF file and correct any errors. 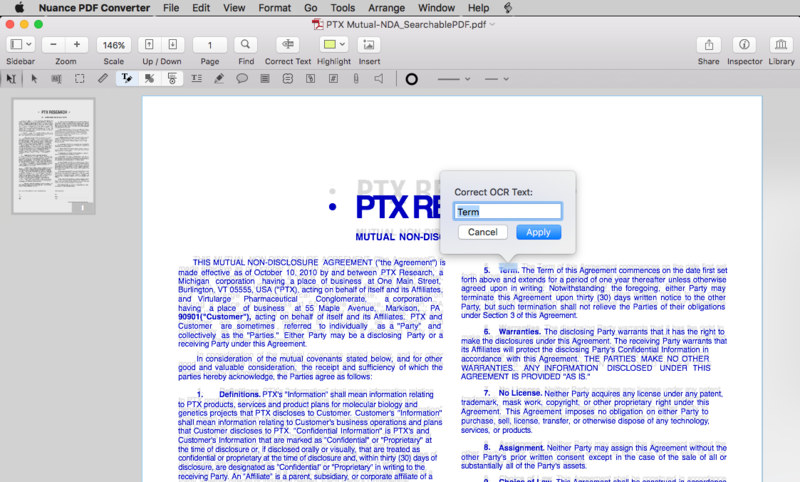 A new auto-deskew feature helps achieve optimal OCR results when performing text recognition on scanned documents. Improved user interface. The user interface has been modernized to adopt the new styles introduced in OS X Yosemite. The toolbar now includes the Share button to easily send a document or share it across devices. Users can edit documents faster with the new context-sensitive control-click or right-click menus. Enhanced annotation tools. A richer set of annotation tools includes new cloud annotation and free-form highlighting tools. The drawing tools preserve custom settings, such as color and line style, so mark-ups will look the same every time they are used. Through the enhanced annotation panel, users can easily review all comments on a document in greater detail than ever before. Customized stamps. Users can make personalized stamps with the text of their choice and add user, date and time information when stamping. In addition, the software comes with a set of new predefined stamps such as Copied, Paid and Scanned. Faster performance. The software delivers faster file opening and saving, and improved scanning performance. Create interactive PDF forms with signature fields. Users can easily design PDF forms using text fields, radio buttons, lists, submit button, and a new interactive signature field tool. In addition, users can sign such forms with their handwritten signature using a mouse or Trackpad. Nuance PDF Converter for Mac is available immediately and can be purchased for $99.99.